Elliptic Technologies, a supplier of security semiconductor intellectual property (SIP) and software based in Ottawa, Canada, has announced release of the SPP-230: ESP/AH (Encapsulating Security Payload/Authentication Header) PDU (Protocol Data Unit) Processor for applications in 4G LTE internet protocol (IP) ethernet-based backhaul networks. (For a reference on IPsec, see the IPsec paper from former AT&T Labs researcher Patrick McDaniel at http://www.patrickmcdaniel.org/pubs/mcdaniel-ipsec.pdf). According to Elliptic's product data sheet, the SPP-230 supports both internet protocol version 4 (IPv4) and next-generation IPv6 mode. The core can be configured for 32-bit or 64-bit bus interfaces, and supports ARM's Advanced eXtensible Interface (AXI)‎ and AMBA High-performance Bus (AHB). 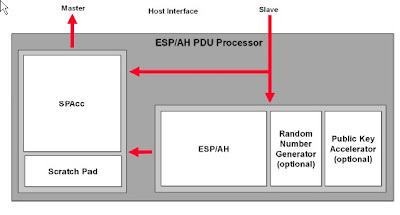 Elliptic delivers the SPP-230 SIP in the form of Verilog hardware-description language (HDL), along with a simulation testbench, sample synthesis script with constraints, a sample simulation script, and documentation. According to the company, the size and performance characteristics are highly dependent on the configuration selected, ranging from 130K gates to 250K gates, not including memories. At 300 MHz, Elliptic states that the throughput for most modes is in the 1.2- 2 Gbps range. Customers for Elliptic's wireless security SIP have included Altair, Applied Micro, Broadcom, Cavium, DesignArt Networks, Picochip (recently acquired by Mindspeed), and Radisys.